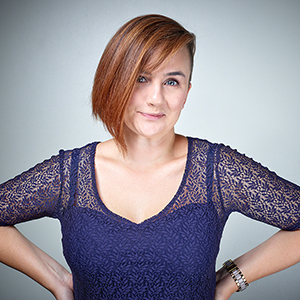 Following on from her recent shows at the Soho Theatre and appearance on Live at the Apollo, alumna Laura Lexx will be performing at the Marlowe Theatre in Canterbury on Tuesday 12 March 2019, as part of The Noise Next Door's Comedy Lock-In. Laura, who is a graduate from the Department of Drama and Theatre, will be featuring as a special guest in the show, alongside comedian Mark Simmons. The Noise Next Door are the UK's premier improv comedy troupe and have appeared on BBC One, BBC Three, ITV1, and BBC Radio 1. Taking audience suggestions, the cheeky and charming quartet, transform them into fantastically funny scenes and songs in the blink of an eye with a perfect blend of ludicrous characters, witty one-liners, epic stories, and explosive physicality. The group is also made of up of Drama and Theatre alumni Tom Livingston, Sam Pacelli, and Robin Hatcher, with film maker Matt Grant.